Well my first thought is that you can wait until dark then turn use each switch in turn and watch for light under/around the closed door. Third start with all of the switches in off position. Then turn the first two on wait 2 mins turn off the second. Wait one min. Enter room and if the light is red hot it’s the switch we left on, if it’s warm then it’s the one we turned off and if its cold it’s the switch we didn’t touch. I have to admit I heard this one a few years ago listening to Car Talk during a drive to Colorado Springs. In about 10 seconds I had an aha! moment. Turn on switch 1, leave it on for a few minutes. If the light is on, light is controlled by switch 2. 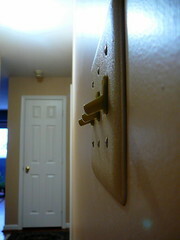 If the light is off and warm, light is controlled by switch 1. If the light is off and cool, light is controlled by switch 3. Turn all the switches off and then just open the door without actually entering the room. Keep your eyes closed while you flip each switch. After flipping the switch, open your eyes and see if the light went on. After three times, anybody should be able to tell which switch it is. After two times, the smart people will have figured it out. If you consider leaving the door open “cheating”, then just get a drill or sledgehammer or battering ram and tell your spouse that you’re installing a clear plastic doggie door (you may need to buy a dog first); perform the steps similar to above after adding the desired opening. If you don’t have a pet, get a sudden interest in antiques and add a big old-fashioned keyhole under the doorknob and look through the keyhole without entering the room. Lastly, if drilling holes or simply leaving the door open is strictly forbidden, and If you say the other two switches are not connected to anything, then simply remove the wallplate and pull out the three switches. If two are not connected to any wires, they aren’t the ones. If they are all connected to wires, but as you say only one is really connected to “anything”, then place your tongue across the terminals of each light switch. At one point you should feel a bit of a twinge, that would be the switch that was connected to the light bulb; you can report your findings after they resuscitate you at the hospital (you may have to write it on paper since your tongue is probably detatched from your body at this point). Lastly, for those people who feel destroying the door or parts of your body violate the spirit of the puzzle, I give my final alternative. With the door closed, turn switch #1 on for a few minutes. Then, get ready to enter the room. Before entering the room, turn switch 1 off and turn switch 2 on. Then enter the room. If the light is on, switch 2 controls the light. If the light is off but the light bulb is hot, then switch 1 controls the light. Else switch 3 controls the light. This works only if you are using a lightbulb which produces heat when on, so I made the assumption that you are not using LEDs or a device such as Reger’s light panel from Return of the Archons. If you are free to manipulate the switches for as long as you like, you can eventually break them from the wall. Then, you can connect the power source to one side of one of the switches, and the three other wires to the other side of the switch, and say that that switch controls the lightbulb. Let’s call the switches s1, s2 & s3. Turn on s1 and s2 and wait 10 minutes or so. Turn s2 off (now s2 & s3 are both off; s1 is still on) and immediately enter room. If bulb is on, you know s1 is the control switch. If bulb is off, you know either s2 or s3 is the control switch. Touch the bulb. If it’s hot to warm, the bulb has recently been on and therefore the control switch is s2. If it’s cool, then the control switch is s3. Love the puzzle, great one to ponder on as I wake up on a Sunday morning. First – Switch on switch number one…. and wait! Now turn off switch one and turn on switch two. Open the door and if the bulb is glowing then the answer is switch two. However, if the room is in darkness carefully enter the room and feel the bulb. I’m sure health and safety would have something to say about this but assuming there is some light from the hallway…. If the bulb is hot then switch one is the answer. If the bulb is cold then switch three is the answer. Hello again Mark – this is a good one. You put two of the switches on, and leave on for 10 minutes or so. Turn one to off (so there is one switch still set to on). Go into the room – if the light is on then it’s obvious which switch it is – if it is off then feel it – if it’s warm to the touch then it’s the one that was on but you switched off and if it’s cold then it’s the third one! Last night, a bit of insomnia prompted me to come up with some more solutions to the switch problem. What is wrong with me?! I limited myself to using only my body (no external props) and avoided methods that required being shocked. Begin with all switches OFF. Enter room. Pull some hairs off of your head. Unscrew light bulb and wind hair around base of light bulb, touching both metal & glass parts of bulb. Screw light bulb back in tightly. Exit room. Turn on switch 1 (S1), stand just outside room and wait about 10 minutes. If you start to smell burning hair then S1 is control switch. If you don’t smell anything, turn S1 off and turn S2 on for 10 minutes, and so on, until you smell burning hair. IF you still don’t smell anything then repeat “Part A” and increase the waiting time by 10 minutes. Repeat Part B as needed. Eventually something should smell terrible! Completely destroy switch 1 by ripping wires out of wall. Damage wires of switch 2 just enough so that contact is barely made and wire is precariously balancing on the contact point. Turn all switches to ON and gracefully enter room. If light is off, S1 is control switch. If light is on, jump and pound on floor & walls to cause vibrations. If light flickers or goes off, S2 is control switch. If light remains steady, S3 is control switch. If this were to happen in one of my less than ideal college dwellings, I could turn on the switches, one by one, until I heard the sound of scurrying cockroaches.